The Onyx HD7500 Horizontal is a 24-inch (610mm) open-ended comb, wire, spiral and coil punch machine for calendar and other applications. It features the patented “quick change” die system for changing punch patterns in 30 seconds. 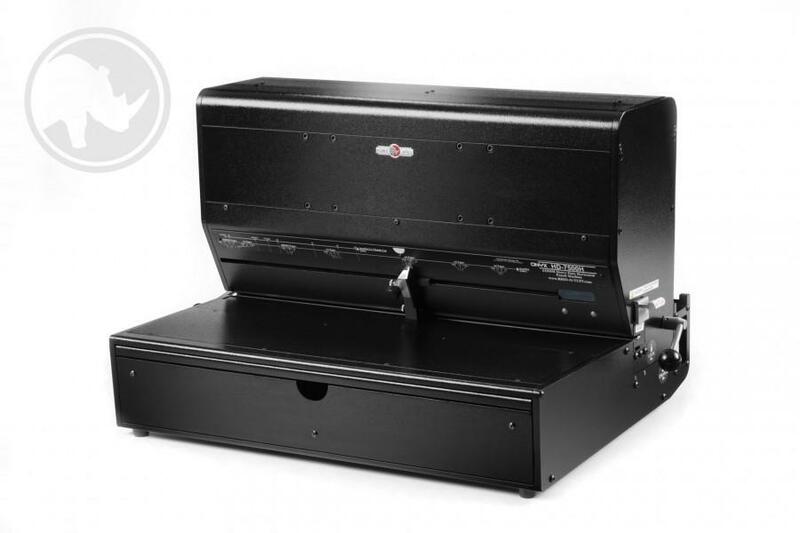 There is built-in die storage to conveniently store two 24-inch (610 mm) dies behind the Onyx HD7500H. It has a Pull-Out Extension Table for larger size jobs, which reduces overall footprint when not in use. The Onyx HD7500 Horizontal was designed with the operator in mind, offering quick, easy set-up including easy pin pulls and pre-set paper stop positions. The machine comes with twin motors, giving you plenty of power for those difficult jobs. Add a three-year warranty on the makes the HD7500 top of its class. Designed for mid to high volume commercial and corporate use.